Alexis Walsh is an artist, designer, and acquaintance of mine living in New York City. I first met Alexis 2 years ago when I was passing through the metropolis. We spent a lovely weekend vintage shopping and doing art projects in her living room, where she drew me a photo for my blog. She has made tremendous strides in her career since our last meeting. 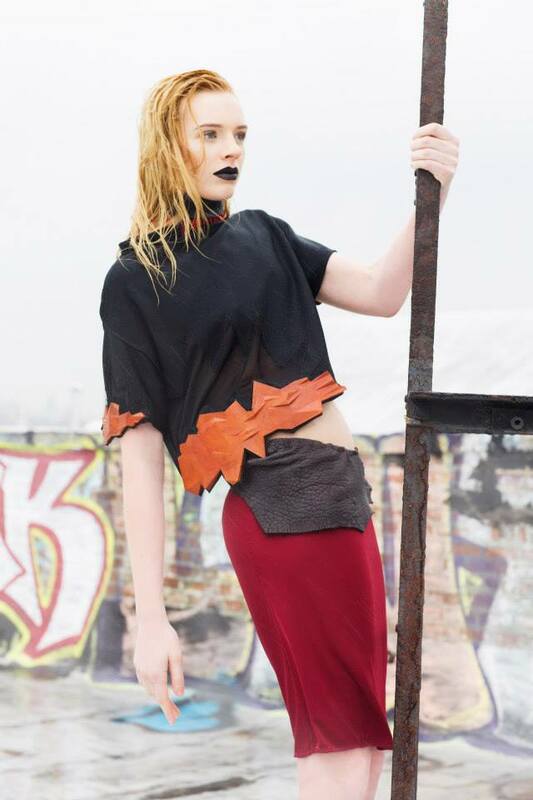 She is currently studying at Parsons New School, and just released her new collection LYSIS. 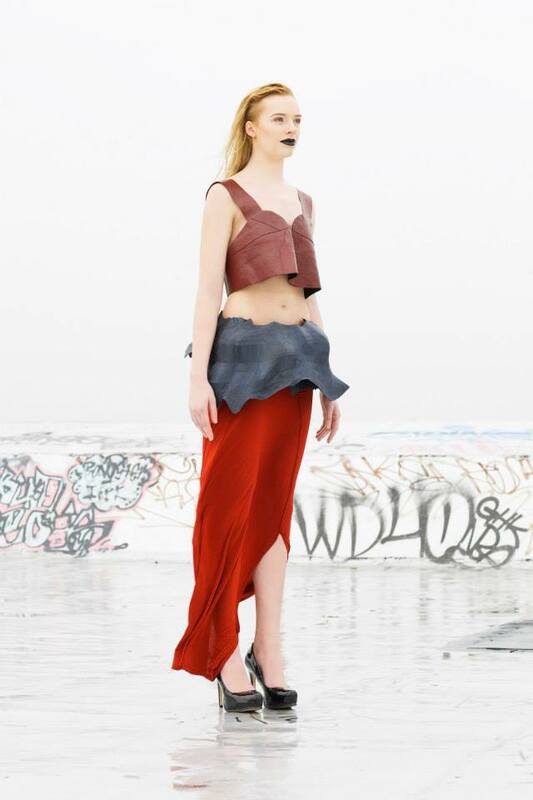 Her innovative designs incorporate 3D printing with a more traditional way of creating clothing. 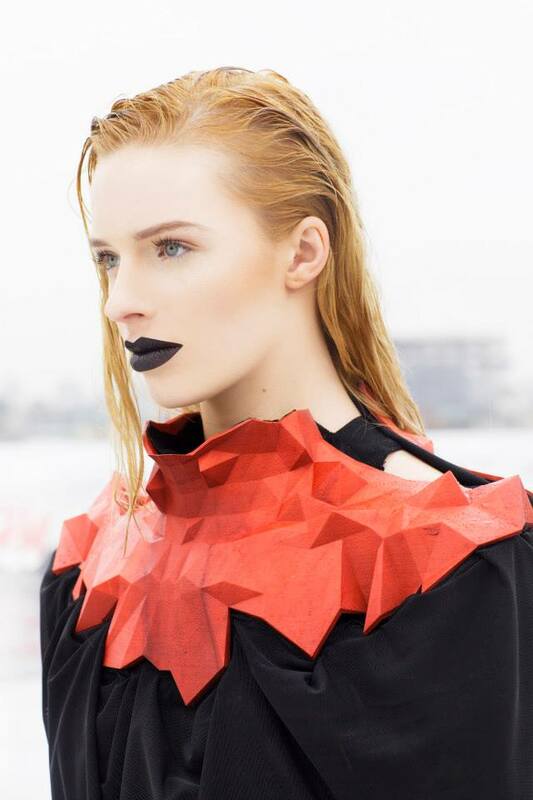 I had previously seen 3D printing as a tool to create rough plastic like shapes, but with Alexis’s creativity and pioneering in the field 3D printing achieves much refinement, integrating with natural forms, and becoming completely wearable. Describing her collection as beautiful is a vast understatement. Her work is a true example of when art and science successfully collide. The aesthetic quality of each of the pieces is quite elegant. She mixes an auburn, orange, and red color palate, of soft draping fabrics juxtaposed by the crystal like forms of 3D design, achieving an unfathomable sophistication. I took the liberty of interviewing Alexis and asking a few questions about her new collection and the direction she sees her work taking in the future. Thanks so much Alexis for your eloquent answers! Photos by Emily Elkins. Video directed by Eli Susser. Produced by The Focal Range. Modeled by Colleen (MSA NYC) Music by Theo Shier. Deena Danielle: Where did the idea for the LYSIS Collection first originate? Are there any significant experiences that have influenced your creative process for this collection? Alexis Walsh: LYSIS COLLECTION draws influence from viral growth and the notion of deterioration. During the process of development, my initial concepts kept referring back to microscopic images of cells in states of lysis – a microbiological stage in which a cell wall disintegrates after a viral attack. My entire family has backgrounds in science: biology, nuerobiology, chemistry, etc., so I have always found myself inspired by it. DD: What is the relationship between the LYSIS collection and the human body? AW: The pieces of LYSIS interact with the body almost as ornamentation. They offer a framework skeleton to the shape of the fabrics and leather, where the forms of the garments are entirely dependent upon the 3D printed parts as a base. These printed parts then sit directly upon the body, and the fabrics flow off of them. DD: In your previous work you have used 3D printing in a solely sculptural way. For this collection how did you choose which fabrics to combine? AW: Since the 3D printed components are more rigid and structural, I wanted to choose fabrics that would flow and drape to offer a contrast in textures. And of course, lots of leather. Leather has become somewhat of a signature in my work. DD: Can you give us some clues about what to expect for your next collection/continuing work? AW: My next pieces will be more focused in jewelry and accessories, and in the next few months I will begin a new collection of garments. DD: Do you have plans for after graduating Parsons New School? AW: I’d like to continue working and launch a new collection of pieces to be sold soon. I definitely want to establish my own studio. I very much look forward to seeing the continuation of Alexis’s work and am anxiously anticipating her next collection. Whatever she is inspired from for her next series of work, the pieces are sure to be exquisite.